Hydro Tec is proud to announce that five of its project have been selected as finalist for the 2016 Superyacht awards. 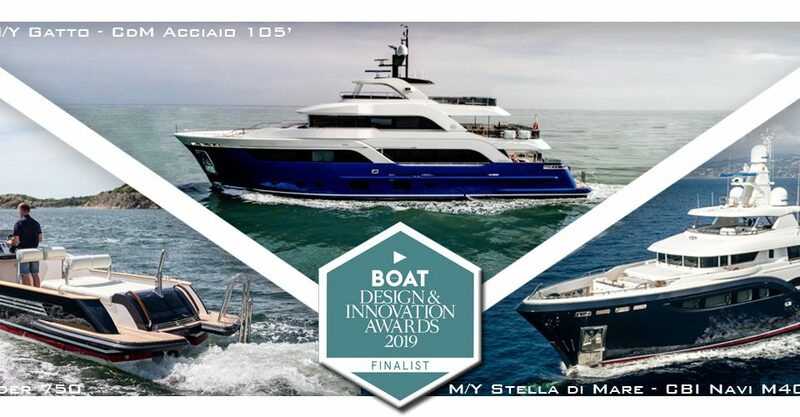 The projects are King Baby, built by IAG yachts, Divine, and Taiba, built by Columbus Yacht and Acala and Storm built by Cantiere delle Marche. The diversity of these 5 projects further underlines the wide experience and the versatility of our company. Divine is the second 40 M Columbus Sport Hybrid. Built as a sistership of the multi-award winning “40”, the yacht has Hydro Tec Naval Architecture, Engineering and Exterior Design. The hull is a semidisplacent type and has been extensively optimized using CFD and tank tested at Krilov in St. Petersburg. Her performances are outstanding and fuel consumption at 14 knots is only 160 ltrs/h. In Diesel Electric mode she can develop a speed of about 8 knots with both generators running. King Baby is built by IAG in China to a design of Evan K Marshall who also designed the interior. She was displayed at FLIB 2015 with great success. Hydro Tec’s contribution to this Yacht was the Naval Architecture and Engineering. The semidisplacement hull has been optimized by adding a bulbous bow and designing deep tunnels for optimal propeller working conditions and in order to limit draught. Storm is the flagship of Cantiere delle Marche We designed the boat applying all the technical and aesthetical characteristics that made the Darwin Class a worldwide success, the volumes, either in terms of accommodation and of storage on board are larger than the usual, the range and the comfort are comparable to the one of bigger boats. Taiba was built by Columbus Yachts and has a full displacement steel hull, with bulbous bow. Hydro Tec contribution to this project has been in the Naval Architecture, Engineering and Exterior Design. She has huge enclosed volumes and a total of six decks keeping an elegant and harmonic line despite her volume. On the technical side she is characterized by an highly efficient hull design that proved to be extremely seaworthy and by extremely low noise and vibrations. Acala is the first hull of the Darwin 102’ for which, Hydro Tec contribution was Naval Architecture, Engineering and Exterior Design. She shares with all the other Darwins the un common interior and exterior spaces , the seaworthiness and technical choices usual for bigger yachts. The exterior features new elements for a more modern look such as bigger squared portholes on the hull, bigger windows and glazed doors on the superstructures, a lowered bulwark on the main deck. Hydro Tec is currently working on eight new projects that will be delivered between 2016 and 2017.